Introducing the Carbon Fiber T50 MOD. 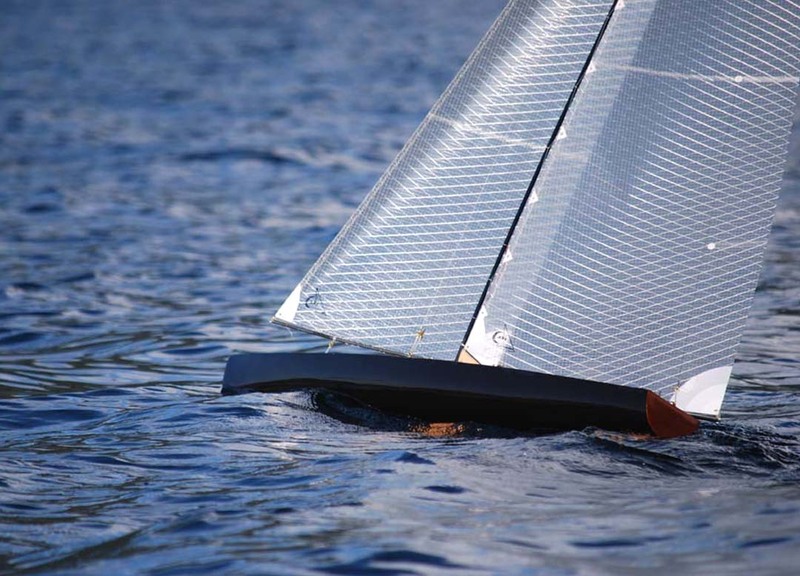 With its lightweight carbon fiber hull and beautiful varnished deck, the Carbon Fiber T50 is the perfect fusion of modern sailing performance coupled with the classic and timeless appearance of wood. The hull is gel coated black carbon fiber, and the deck is the same very light plywood single piece deck that is provided with the cedar strip version of the T50. The carbon fiber T50MOD kit is very comprehensive. It includes the formed carbon fiber hull, precut wood deck, hardware, keel and keel bulb, epoxy, a 2.4 ghz digital radio, presewn 3/4 oz. nylon spinnaker-cloth sails, servos (including a powerful drum winch sail servo), carbon fiber booms and mast, and complete instructions filled with pictures to guide you through the building process. The carbon fiber T50MOD is beautiful and fast, strong and light. It will give you and your family generations of sailing fun! Substitute mylar sails (shown in the sailing pictures above) in place of the standard nylon spinnaker cloth sails for $965.00 as a kit.